So you make websites, right? I loved writing and enjoyed having my own blog after seeing that social networks like MySpace or Fotolog weren’t going too far. I kept learning and found the power of WordPress to create more complex sites. I decided that my hobby could be my job. I became a freelancer. I found clients, I made lots of mistakes, I didn’t make much money. I was alone in my small village in the North of Spain: Santoña, in Cantabria. I knew I wasn’t the only one creating websites around, but I never thought about meeting people like me. I didn’t know about the real power of Open Source. I was isolated, planning to move with my girlfriend to another city, Pontevedra, and I didn’t have a clue about what was going to happen soon in my life. One day I found out that in November of 2015 there was going to be a WordCamp in Santander, a city 50 km. far from my village. An event for WordPress developers and users. That sounded good. I had no idea that that kind of events were happening all around the world. I had no idea about anything related to the WordPress Community. I didn’t know that the Community was even a thing. So I went there a Saturday morning and attended to most of the talks. I remember sitting in the last rows, as if I were hiding so no one would notice that I was there alone. I didn’t want to say anything stupid and I was just absorbing all I could from the speakers and their presentations. After a great talk about theme development I waited for the speaker and I thanked him for all the info. I was nervous. He was a speaker. He was from another league, right? But he was a really nice guy, ‘if you have any doubt, just ask me’. Cool. On Sunday we had the Contributor’s Day. And there I was, randomly in the Community table, learning how to organize a Meetup with some people I had just met, Rocío Valdivia and Ibon Azkoitia. Remember these names. They told me that, as I was moving to another city where there wasn’t any WordPress group, I could start one myself. My brain: Wait a second. Me? Starting a WordPress Meetup in Pontevedra? I took notes and kept enjoying the day. I met many people and, being not very good remembering names, all I could do was following them on Twitter. And signing in the WP Slack channel. At the end of the event, Darío, the main organizer asked me about how was the experience. I had loved it. Will you come back? Yeah, but next year… as a speaker! My brain, again: As a speaker? Are you really listening to yourself? You hate speaking in public. You’re the most nervous person ever. The days after the event were weird. I started reading about the people I met and I found out that some of them were incredible developers, some of them had thousands of followers in Twitter, some of them had the most important websites about WordPress in our language… And I didn’t have a clue about all that. Did it matter? Not at all. These people don’t care about those things and will help you no matter who you are or where you are coming from. Moving to a new place was a slow process, so I didn’t have to worry about the Meetup I promised to organize, but the weeks were running and I had no idea about what to talk about in the next WordCamp as I told Darío. I started to become a little more involved in the Community. I helped translating plugins to Spanish. The original translation of WooCommerce was made by a drunk robot or similar, so there were thousands of strings to be revised and translated again. It was fun. And a lot of work that I did with the help of Fernando Tellado, an experienced translator and member of the Community. 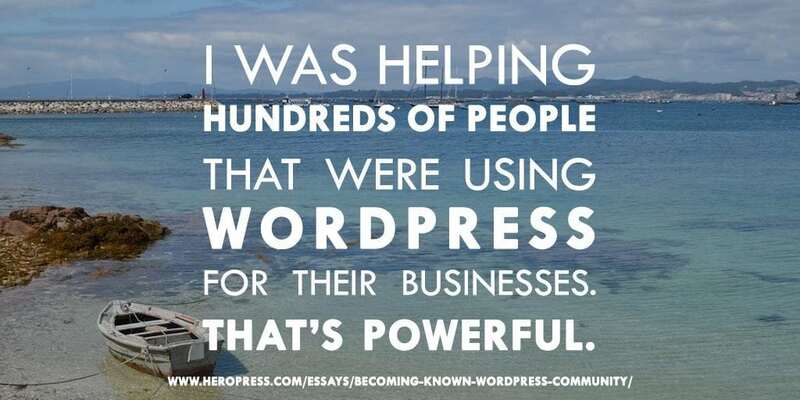 And I was helping hundreds of people that were using WordPress for their businesses. That’s powerful. I was helping many people. By that time I was reading many WordPress related blogs and sites and I decided to curate a weekly post with the ten best links (in Spanish and English) I read every week. That’s how I started Enlace Permanente, which is almost now in its #70 edition with many subscribers to the newsletter and followers. I kept talking with Ibon, Darío and others in the Slack channels and on September of 2016 we decided to go to WordCamp Seville. I travelled the country from North to South and spent there a fantastic weekend. I shared an AirBnb apartment with Ibon, Mauricio Gelves and Fernan Díez, who became great friends. I met more new people and strengthened the relationship with ‘older’ mates. And, as I was finally moving to a new flat in Pontevedra, I decided it was time to start the local Community of the city. A city where I didn’t know any other developer or WordPress user. But… I was sure someone will be there. I had the help of Rocío, an Automattician who works for the WP Foundation helping people to organize Meetups and WordCamps. She was extremely helpful and she’s the reason that today in Spain we have more than 40 different Meetups and 5 WordCamps in 2017. I planned the first event for the end of November, but before, I had to send an email to Darío as the Call for Speakers of WordCamp Santander 2016 was already open. I decided to talk about my experience the last year. ‘From being no one to being a speaker: a year in the Spanish WordPress Community’. That was the title of my talk. And yes, I was nervous. I didn’t sleep well the week before. I talked quickly. But I did it. People laughed, people clapped and people enjoyed my story. This story. And they learned about how they could help an awesome Open Source project like WordPress and meet great people at the same time. When you become part of a Community for the first time, you easily find that there are small groups within the big one. People that already know each other of past events, of past projects. And maybe you think that it’s not easy to be part of those groups. Or that they won’t accept a new one. Well, that didn’t happen to me in the WordPress Community. Everyone was ready to say ‘hi’ to the latest addition. Everyone was ready to help with translation doubts. Everyone was ready to share their experience organizing local groups. Or answering questions in the support forums. Or just ready to chit chat. Or to organize a trip for the next WordCamp. So I just started doing the same. And you don’t do it to become a known member of the Community. That’s just a catchy phrase for the post. You do it because it feels good. Because you meet great developers, designers, freelancers… Because you can help anyone who knows a little less than you, the same way that the people that know more help you. In 2017 I was lucky enough to be part of WordCamp Madrid and WordCamp Bilbao, as a volunteer and as a speaker. I had the chance to talk about something that I’m really passionate in Madrid: the open web. I had the chance to speak up about net neutrality, about our contents, about walled gardens, about what we can do to save the web. I shared an important message with my peers. And in Bilbao I had the chance to explain the process of creating a WordPress theme from the moment the designer starts wireframing a project. My day to day job. Best practices, advice, tools, how-tos… I showed how I do my job to become better at it and to help others to become better too. Also in Pontevedra, we’re around 20-25 people every month in the local Meetup. And in Galicia, the region where I live, I’ve helped creating two more Meetup groups, in Ourense & Lugo. And I’m sure there will be more soon! There are almost 3 million people here, so many WordPress users still to find! I want to keep having fun and working to make WordPress a better tool and platform for as many people as possible. I want to find more people in the local communities to show them what we have here. And who knows? Maybe organizing a WordCamp in 2018. Also, in the next months I would like to find out if it’s possible also to become a more active member of the Global WordPress Community. As English is not our first language and we’re a little shy, probably not many Spanish speakers are known in the WP world. But I’m sure that the steps I did to become part of our national group can be done exactly the same way to be part of the international one, don’t you think? So, who knows? Will I go to a WordCamp in the USA or another country next year… as a speaker? And you? Are you ready to become part of your local and national Community? It’s easier than you think, I’m sure of that. Just… say it out loud and start doing stuff. The post Becoming Known in the WordPress Community appeared first on HeroPress.